One thing I really like about apple season is how we’re still able to buy them at great prices, even at the start. Cherries, berries and some other fruits start off their season with price tags equivalent to a family SUV before tapering off to a decent level. Apples just seem to be in it for the recipes. And it’s like an apple’s destiny to be in a pie…or, for that matter, a galette, which was the apple of my eye today. Galettes are super friendly to make – in fact, the more rustic the better. Usually baking is such a precise exercise, but galettes are so willy-nilly. 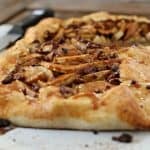 Just plop the apples in the center of the dough and pull up the edges, glaze it and throw it in the oven. Sometimes the best tasting food is not the best looking food. Some more great apple recipes right here! 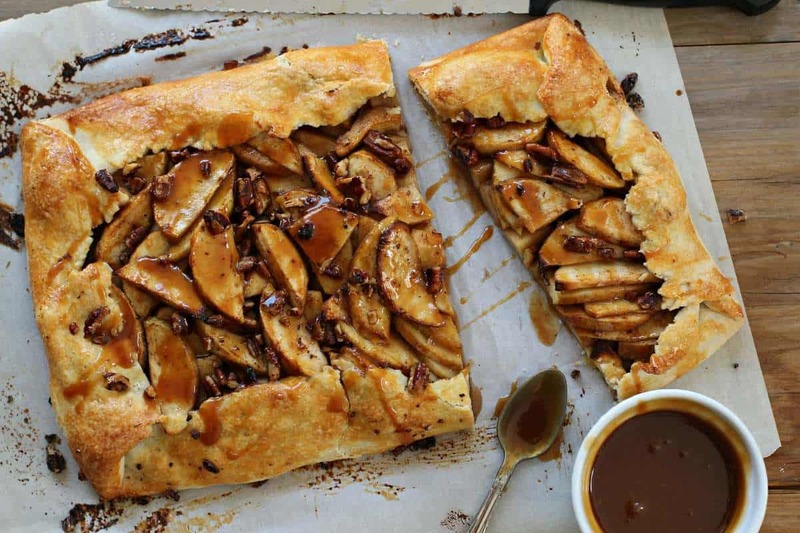 a classic Galette filled with apples and buttery pecans. Preheat the oven to 380 degrees F. Line a 15 x 10 baking tray with parchment paper. In a bowl add the flour, salt and sugar and mix together. Cut the butter into cubes and add half to the flour. Using your fingers rub the butter in the flour until it breaks down and is pea-sized. Add the rest of the butter and rub it in. Next add the iced water gradually, mixing with your fingers until the dough comes together in a ball. Wrap the dough in plastic wrap and let rest in the refrigerator. Peel and core the apples. Cut in to halves and then slice thinly, about a half inch thick. Transfer the slices to a mixing bowl. Add the cinnamon, cloves, nutmeg, lime juice and brown sugar. Toss until all of the apples are well coated. Let rest for 10 minutes. Retrieve the dough from the fridge and start to roll it out on a well floured surface. The finished size should be enough to fill a 15 x 10 baking tray. Line the baking tray with parchment paper and roll the dough large enough to cover it. Place it on top of the paper. Lay the apples in a heap in the center of the dough. Pull up about 2 inches of dough on each side making sure not to poke any holes in the dough. Sprinkle the pecans over the apples. Glaze the dough with the beaten egg and sprinkle lightly with some more sugar. Place in the oven and bake for about 25-30 minutes or until golden brown. Place the sugar in a small pan and add the water and corn syrup. Boil over a medium heat until the sugar is a deep amber color. Add the butter and whisk until dissolved. Add the heavy cream and whisk again until the sauce is smooth and shiny. Set aside to cool. 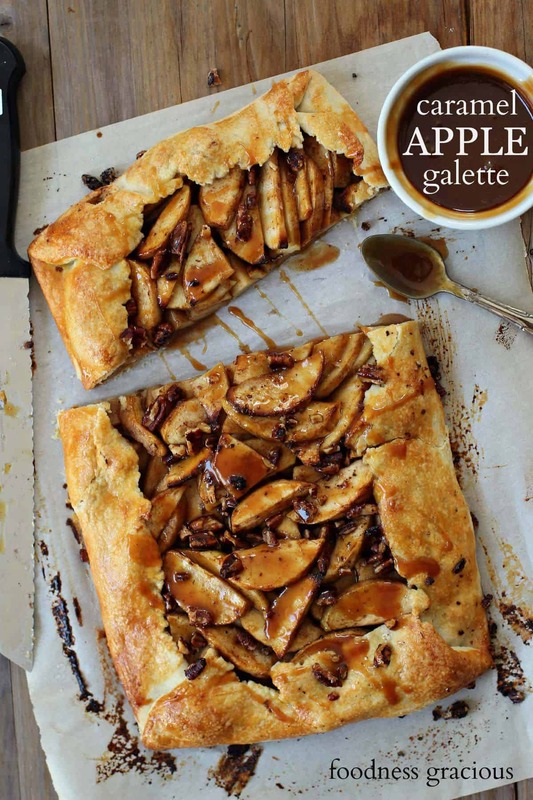 Once the galette is ready, drizzle liberally with the caramel sauce. Serve at once with some whipped cream or ice cream. Combing summer and fall! I love it! 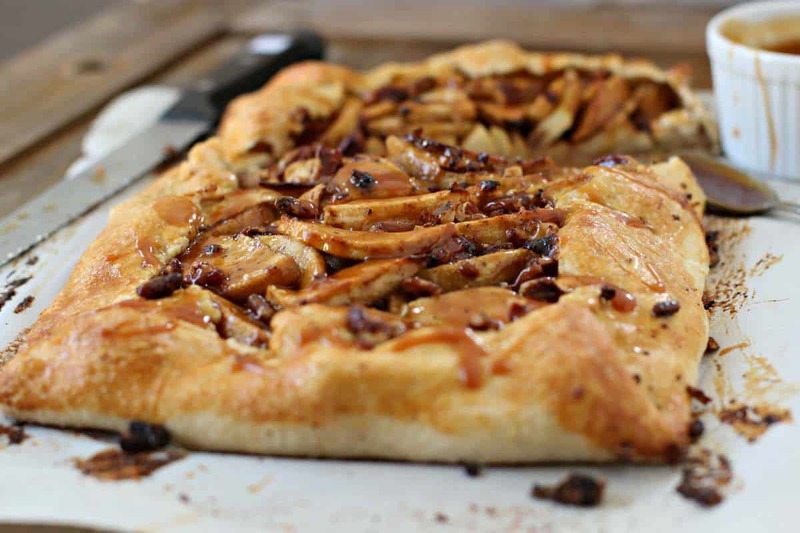 As much as I don’t want summer go, I sure am glad that autumn is here…your galette looks super, Gerry. The photos are as amazing as your galette. Gorgeous! Makes me want to run to the market and buy apples. Run Barbara and don’t stop until you have a giant bag! I’ve been dreaming of this galette since I saw your Instagram. Gorgeous, pinned! Wow Gerry – you really nailed Autumn with this recipe. I am a galette fan all the way. Caramel? Oh my! I also love cooking with Granny Smith apples, the crisp, juicy, tartness is perfect for desserts. Yum! Tricia, I am here to nail Autumn, and whats an apple without caramel?? This galette looks fantastic! Love the addition of the caramel sauce and the pecans. And also — the lime juice! What a great idea. I’ve usually seen lemon juice added to apple pie-type desserts, but I can imagine that lime would add a different type of complexity. And you’re absolutely right about apple prices versus some other fruits. I wanted to make more blueberry desserts this summer, but I just couldn’t justify the expense. But when I can get a whole bushel of apples for just a few dollars? Then, I feel like I can bake to my heart’s content! Thanks Jamie, glad you could stop by! Apples forever!! Yeah so many times at the store I have handed over banana peels, lara bar wrappers and apple cores with the sticker on my hand to the checker since my kids seem to think whole foods is their own personal buffet. And LOL at the price of berries being the same as an SUV payment. SO true. I am a granny smith fan as well as pink lady and jazz apples. I like the sweet-tart from the pink lady’s best but the granny’s are best for baking hands down. I don’t know what you are talking about when you say the best tasting food is not always the prettiest because this is gorgeous! I’ve been seeing galettes pop up all over lately but I have never tried one. Maybe I should give it a go now! Yum this looks delicious. I can’t think of flavors that are more like fall. Love this! This is beautiful!! I am so loving the combo of flavors. And I so agree, isn’t it nice to be able to afford the star ingredient??? 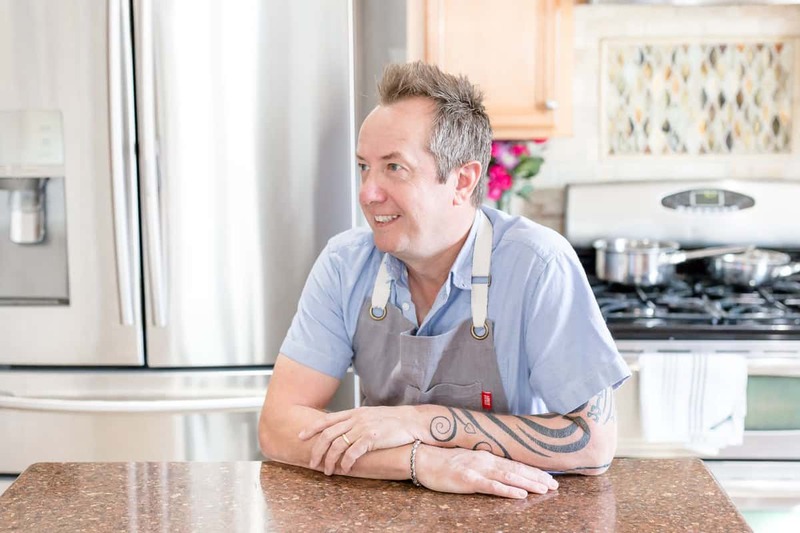 Gerry, I was just going through the list of IFBC attendees & am thrilled to see you’re on it. I’m not sure how easy it will be to find people, but I’ll make a point of keeping an eye out for you! It’s getting so close now! Susan, I can’t wait. It’s going to be awesome! I’ve been searching for a recipe with this combination and this looks delicious!! I will be making this. Can this be made a day ahead and baked before dinner?